After much heart searching and procrastination, we decided to let “Gemima” our trusty Austin 16/6 go to a new home. She had been part of the family for some 28 years and had taken us many miles including a trip to southern Spain. Not only had she seemingly got wider in the Cornish lanes but had put on weight, or was it me getting older and weaker, anyway, away she went. We had met Andrew and Regi Jarmin some time before and our thoughts turned towards a 'Seven' as a replacement. Advice was sought and digested, then I saw a Mulliner advertised on the internet. We decided to go for it despite not having seen it, We had to change one of our everyday tin boxes to one with a towbar and set off to the big smoke to pick up our new acquisition. Although a non runner, we were told that she had been rebuilt in the early 80’s then spent many years in a car showroom as an attraction before being sold to London where she was registered with the A7 club. As far as we can tell she hardly turned a wheel from 94 to this year but she was pretty and unusual and cosmetically very tidy. On arrival back in pastyland we had a visit from a knowledgeable club member who umm’ed and ahh’ed took the pee but after a bit of lip sucking agreed that we had done ok, but weren't too sure about the white wheels, but we like them. I then set to, to re commission her. I ended up rewiring everything, not that there is a lot of wire, got the mag to spark but had trouble getting my hair to stay flat after holding the end and spinning the cog, Much help and advice from Andrew and Malcolm and cups of coffee and food from Regi and it was time to go for the MOT. Oh dear it was then that we found a few other problems but with a lot of help with the king pins, track rod ends and a spot of welding on the radius arms she was all legal and running reasonably well. 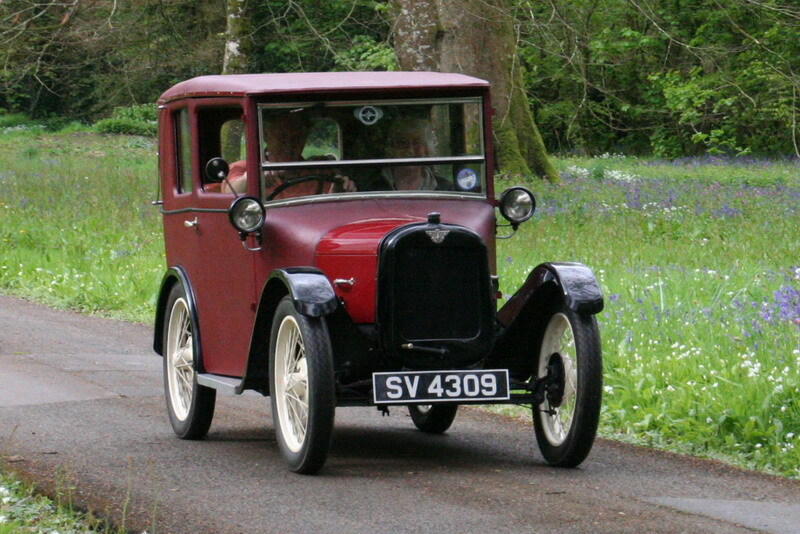 The first run with the club was to Pencarrow House, near Bodmin on FBHVC 'Drive it Day' 2008, a fair distance. We met up at the usual lay-by enjoyed the hugs and welcome and eventually set off for St Austell. About a mile later we ground to a halt, but to our surprise it seemed that everyone else had also broken down as there were the whole Club behind us. I saw the mob descending on us but noticed that spanners were in hand, “ Blocked jet” was muttered and Andrew swiftly removed said object , cleaned it and we were off again, I was impressed, I had been willing to go home at that point to overhaul the carb but no one would hear of it, “We’ve all been there” was the comment but I think they were just glad it was us and not them. We did have a few more “ involuntary stops” after that but enjoyed a great day with people who made us very welcome and made sure that we were able to get home ok. Since then we have taken part in the Club holiday to Jurassic Coast event although we did trailer the car there; also The Wadebridge Ramble and most recently the Stithians Lake weekend. Great fun and we now really feel part of the whole thing, still having a few problems with the carbs getting blocked but as I've just re-cleaned the tank, I'm hopeful that we will be able to do a whole run without stopping. So my thought on the car, I'm not disappointed, takes a bit of getting used to seemingly thrashing the living daylights out of the engine going up hills but I’m assured they like this. The Mulliner is a bit unusual but would you believe there is another and possibly two more locally. Mechanically its great, I can lift any part of her without risking a hernia and although I’m 6 foot tall, I am very comfortable. Rosie and I fit in like a hand in a glove and there’s even room for our dog George. The club has provided us with friendship and a very good reason to get out in the car. The generosity of some of the members is impressive and the collective knowledge is extensive. This article, written by Tony Turner, originally appeared in Seven Focus September 2009 pp10-12. Tony sold the Mulliner in June 2011. Tony passed away in January 2012, a great friend sadly missed.